Glass is the final movie in M. Night Shyamalan’s superhero trilogy, and fans have been excited since the easter egg ending of Split. 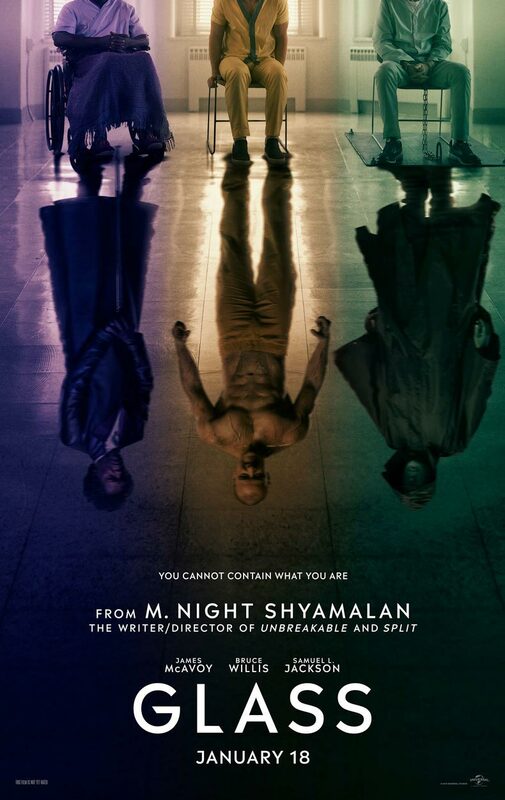 This movie brings together the characters from both Unbreakable and Split, creating a new take on the idea of superheroes. In a world so focused on superheroes, it’s surprising and refreshing to see something tackle the subject matter in a new way. This isn’t a humorous sci-fi adventure like Guardians of the Galaxy, a grimdark vigilante tale like a Batman movie, or an over the top capes and super beings royal rumble like an Avengers movie. Instead, this is a fairly grounded story that is first and foremost an exploration of characters. It is the characters, not the super powers and special effects, that drive this movie. And it is because of that that this movie has so much to offer. Before we dig into spoiler territory, it’s suffice to say that I really enjoyed this film. I liked Unbreakable, and I liked Split, but seeing the culmination of those events and characters in this chapter really elevated the story in my opinion. It’s kind of like an Avengers team up event, though everyone is fighting each other in this one. But it’s not a light and humorous film. This one is more grimdark in the way of Batman with a cerebral focus on the characters and themes. And there is certainly a lot of themes at play. On one level, there’s Mister Glass’ theme of comic books being tales that contain a grain of truth. Out there somewhere are people who do have super powers. There are people capable of extraordinary things, and if motivated, they can become superheroes or supervillains. Then there is Bruce Willis’ character, David Dunn, aka The Overseer. He’s an ordinary person who discovers he has super powers and he has to decide if he wants to use those powers to help people and punish those who prey on the weak. It’s the story of a vigilante who is not completely comfortable with what they’re doing, but is selflessly motivated to do the right thing and help others, and has to deal with the consequences. Kevin and the Horde bring up the themes of mental health, which gets brought up with the other characters as well, plus the ideas of redemption, forgiveness, trauma, bullying, and primal urges. Beyond those themes, there are others that get unveiled in the twists. All of it comes together to make a very satisfying movie. I can only speak for myself, but I thought Glass was great. I loved the character journeys, the developments, and the twists. I’ve heard others who were not as enamored with it as I am, but to each their own. This isn’t a Marvel or DC movie, nor is it a straight sequel to Unbreakable or Split. This is a movie that merges the themes and characters from both films to create a final chapter. It’s a movie that has some action, but focuses more on the characters and the motivations of human beings. It ponders what the world might be like if people really did have super powers. It’s grounded and realistic, even though we do get a person who is super smart, a person who has unbreakable bones, and an individual who can climb walls and bear hug people to death. It’s something different, something creative, and for me, something very enjoyable. It’s also a movie the begs to be rewatched. As such, I give it a five out of five metal bikinis and highly recommend it to anyone to has seen the previous two films. One of the characters I didn’t touch on is Dr. Ellie Staple, the psychiatrist who tries to “treat” the superheroes of the film. At first she appears to be someone who is completely oblivious to the idea that people could actually have superpowers. She almost convinces all of them that it’s all in their head, that the powers do not exist. However, in the end we learn that she is really part of a group that opposes these super beings. Their motivation is to maintain balance by eliminating both the superheroes and the supervillains. Identified by the symbol of a black clover, they are united in their attempts to do what they think is the right thing. As a gamer, this reminded me of the story idea behind the Assassin’s Creed franchise. There are two diametrically opposed groups of extremists, one representing choas, and one representing order. If either side is in power, the world suffers, so the key to prosperity lies in a balance. It’s another take on the Force and the dark side and the light side. In Shyamalan’s universe, it’s a balance between the good guys and the bad guys, but instead of letting people like The Overseer fight people like Mister Glass and The Beast, the Black Clover group kills them all for the greater good. So here’s the thing: is the Black Clover group evil? Are they the real bad guys? Are they worse than Mister Glass? Were the others right in exposing the existence of superheroes, thus undermining the efforts of the Black Clover group and potentially unleashing who knows how many superheroes and supervillains around the world who were ignorant or in denial about their powers? The movie doesn’t answer that question, and it doesn’t need to. According to Shyamalan, he’s not making any move movies in this universe. This is it. Any questions raised in this film will remain unanswered, but the point is to raise those issues with the audience and allow them to seek their own answers. After all, is there really a right or wrong answer in this equation? Good and evil are often in the eye of the beholder. The important point is that the movie can bring about such interesting topics for discussion. It’s one of the reasons I enjoyed the film so much and continue to think about it.